My Sangoma training came about after I consulted another Sangoma and was told it was my calling to become a Sangoma myself. I was further informed that until I took up this calling, I would repetitively become ill – and how right she was! Eventually I heeded the ‘calling’, as unusual as it was for a young, English woman to enter the mysterious realm of African mysticism in this country in those days. Training was harsh and intense with my mentor, and disciplines of divination, dream interpretation, various rituals and studying indigenous medicines was undertaken over a two and a half year period. One of the skills I was taught is known as ‘throwing the bones’. Since the beginning of recorded history the notion of throwing tokens, casting the dice or drawing lots to interpret the divine will of spirit or the Ancestors is viewed as symbolically linking the diviner to his or her mission. Casting or throwing the bones is an ancient practice native to many regions of the world, including Africa, Asia, and North America. 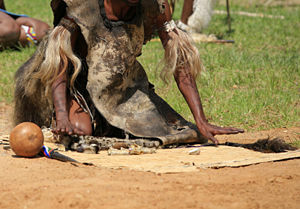 In Southern Africa it is a long-standing ritual among the Sangomas of the Zulu, Swazi, Xhosa and Ndebele traditions. Each bone or token used for casting is part of a kit the Sangoma carefully selects under the guidance of spirit, initially with the help of a mentor. It is spirit that instructs the seeker as to the symbolism and meaning of each sacred item in the collection, and precisely instructs the student on where to find it and which one to use in divination. In Southern Africa, a mentor assists the Thwasa (trainee Sangoma) in the process of learning to receive information from the bones, and in reading the patterns in which the bones are likely to fall. Traditional healers believe that actual bones are the tokens closest to the earth and one’s roots. The Sangoma’s bone collection can contain several small objects and natural curios, including bones, shells, beads, wood, ivory, crystals, stones and other objects meaningful to the diviner. Initially, my bones kit consisted of bones from, among others, baboons, lions, anteaters, wild pigs – all gathered from deceased animals. Gradually, over time, I also added shells, seeds, tree bark, money, crystals and various other trinkets which ‘speak to me’. Each trinket in my kit has a special meaning. For example, the famous hyena bone can represent the thief who comes after dark. I have a special cloth onto which the bones are thrown, whilst the querent sits barefoot on the floor. A special prayer is sent to my Ancestors asking for their assistance in channeling accurate information to my client. I wear a special beaded headdress when doing a bone reading, which in African culture is said to call the Ancestors to sit upon the beads whilst whispering into the diviner’s ear. The bones are stored in a pouch. I invoke the assistance of my Ancestors, trusting they will work with me in unraveling the patterns in which the bones fall, and how they line up relating to one another. Prior to casting, I make the Ancestral connection, then blow on the bones, saturating them with my energy and then ask the client to do the same. I even follow this procedure for phone readings, asking the customer to blow down the phone, and it seems to work! Like other types of readings the bone readings highlight events past, present and future. After shaking the bones, until I feel the moment is right, I throw them and proceed in interpreting their unique message, throwing the bones for my client’s individual question. Although this may seem like an old-fashioned or out-dated tradition, it is not dying out. On the contrary, more and more people from all walks of life and cultures want to ‘have their bones read’. Thanks Shani – I have lived in Africa for many years and very aware of the Sangoma in our very diverse cultures. But I always thought the Sangoma was only consulted for things such as ailments, fertility and yes, maybe some ‘black magic’ (always handy for finding your soul mate or disposing of a rival or partner!!!). Now I know what ‘throwing the bones’ is all about. What do the bones tell you about the future of South Africa?